Imagine going on a study trip with your fellow students from the Master’s programme you’re currently following. Imagine being excited for this trip where you hope to seek some inspiration and to get to know each other a bit better. Sounds good, right? Imagine having a deadline for a paper on the day you leave for this study trip. No matter how many times you tell yourself you will not hand it in at the last minute – it always happens. This might give a sense of the state of mind of 30 European Law students at 6:30 AM: tired, elated, excited, but most of all tired. Or you know, surviving on the 30 minutes of sleep one of us had. That same person was one of the few who continued in the karaoke bar after half of the students had already left for bed, but more on that later. With the rain greeting us after our arrival in the morning in Brussels with the official Team NL bus, we first visited the US Mission to the EU. The US has three ‘missions’ or ‘embassies’ based in Brussels: one for Belgium, one for NATO and one for the EU. During our conversation with Walter Parrs, some various topics like the US privacy shield and the influence of the American President on the mission were discussed. 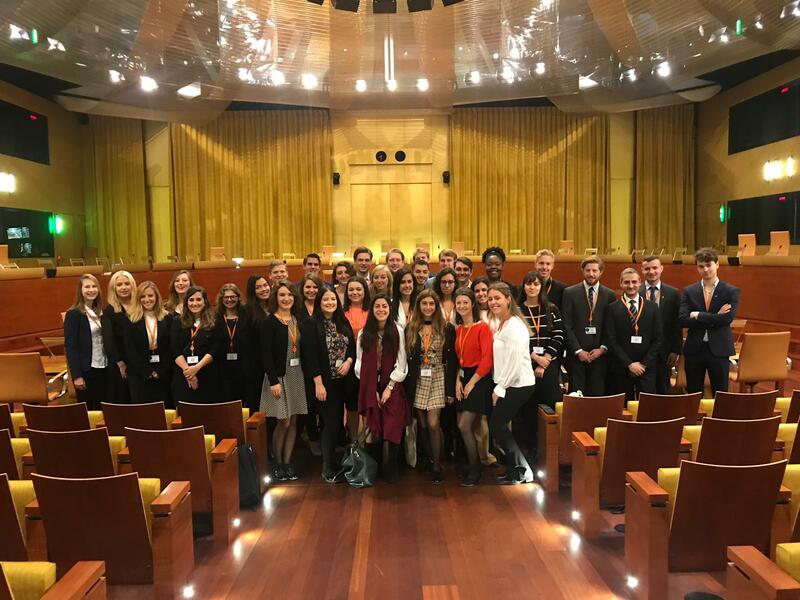 A European Law study trip is not complete without visits to some of the highlights of the European institutions in Brussels: in the European Commission’s visitors centre we listened to three speakers on the topics of the Digital Single Market, the European Union legislative procedure and the protection of consumers. Each of the speakers received stroopwafels, aka Dutch Delight. Since we had the honour of meeting and talking to many interesting people, there was an entire bag devoted to tins with stroopwafels (thanks Nathan!). After having settled down and assigned the rooms in the hostel, we all had dinner and met up again in one of the many cafes in Brussels where the teachers joined us as well. The night ended at various times – half of the students had a very short night’s sleep as they had sang at the top of their lungs to songs from (among others) ABBA and Kelly Clarkson. The photos and videos still haunt some of the singers, but they’re memories that should and will be cherished. A study trip is also no study trip if it doesn’t include early wake up calls, scheduled shower times and a breakfast buffet. Since our time was limited, we said goodbye to our hostel and left for the Council of the European Union. One tip in case you ever decide to live for a certain period of time in Brussels: find yourself an apartment within walking distance of wherever you work or get a bike. It doesn’t matter at what time you leave, traffic is always bad in Brussels – which is why our bus driver likes to avoid driving in Brussels as much as possible. Too bad he was put on this trip. The Council has an impressive atrium, with all the 28 flags of the Member States of the EU and the sign of the current Austrian presidency. The presentation given by Pierre Saglier, one of the main people leading the Brexit-negotiations, shed some much needed light on the Brexit situation. By explaining the real life implications of Brexit, the entire ordeal became something much more than another item that keeps appearing on the news. The last visit we made in Brussels was a visit to the Brussels law firm office of CMS Derks Star Busmann, where they focus a lot of their work on competition law – very relevant for us as European law students. What followed after another long day in Brussels was the trip to Luxembourg, where we arrived later in the evening. We were in the outskirts of Luxembourg city and we discovered the one street with restaurants already covered in Christmas decorations. In the end, we never really saw Luxembourg during the day since we had another early call the following morning where we started our day at the Court of Justice of the European Union. The Court is an impressive and modern architectural project from the outside and the inside. We had a tour around the Court, were briefed on the facts and possible implications of the intellectual property rights-related hearing we went to, and finished the visit with a lunch with Sacha Prechal, the Dutch judge at the CJEU. Sacha Prechal was kind enough to take time out of her schedule to talk to some of the students who were interested in hearing her stories. The very last but not least part of the three day trip was a visit to the European Court of Auditors. This went from being a fairly unknown institution to an institution about which the questions of the students had no end. Luckily there wasn’t much traffic on the way home and soon we found ourselves in our own beds back in the Netherlands – spread out over the country again. I look back on this trip as intense, important and above all inspiring. Intense, since we had a fully packed programme which we survived on little sleep. Important, since it’s good to know what you’re studying about and to actually see Union law in practice. Inspiring, since it gave us new ideas for the future and allowed us to think a little bit more about what we want to achieve – at least for me. Dear European Law students, thank you for making this trip incredibly fun. We still have two final exams to get through before we finish the first period of the year, so I wish us all lots of good luck! May we stay in this Brussels bubble for the rest of the Master’s year with many more photos and videos to look back on.